We are still waiting for details on the tragic crash that killed Sam Ferrito, a 56-year-old Oak Creek man who was hit a little after 6 p.m. Sunday while biking on S. Nicholson Rd. According to the Oak Creek police, an 18-year-old driver hit Ferrito from behind while he was riding on Nicholson. Flight for life responded, but Ferrito did not survive his injuries. Crashes like this are relatively rare and typically only happen on rural or suburban roads, not in urban areas, but when they do happen, they are often fatal. The actual crash report has not been released yet, and until that is out and the District Attorney has reviewed the death, we can’t speculate about fault. That said, a look at the location shows that this segment of Nicholson serves as an on-street connection between two segments of the Oak Leaf Trail, yet there is no bicycle accommodation like a bike lane or paved shoulder. The fog line is very close to the edge of the asphalt and the shoulder is gravel. A street that connects two segments of the Oak Leaf Trail should have 4 ft paved shoulders at a minimum, and in this case, perhaps a parallel side path. Thanks to Wisconsin’s Complete Streets law, those safety improvements will probably come when Nicholson is next resurfaced or reconstructed. Wisconsin is actually pretty good about adding paved shoulders to highways around the state, but there remain many “incomplete” streets with no shoulder and only one travel lane in each direction that must be shared by motorists as well as people riding bicycles and walking. Until all our streets are complete streets, all users need to be more aware of each other and share the road. To ensure that any mode of travel is safe, we need to look at more than engineering facilities. Engineers and planners typically look at the “Five Es” of traffic safety. Those Es are: Engineering, Education, Enforcement, Encouragement, and Evaluation. The Bicycle Federation of Wisconsin is doing all we can in all of those areas. We already work with communities to help engineers design attractive, safe and convenient bicycle facilities like trails and bike lanes. The Bike Fed is also working to educate thousands of children how to ride safely and legally through our Safe Routes to School programming. As part of that Safe Routes programming, we also work with law enforcement agencies to enforce the laws related to bicycling for both cyclists and motorists. The two-year program only began a few months ago, and the Bike Fed is just beginning to get the ads and PSAs out, but already more than 600,000 people have seen or heard our radio or printed ads. The program also uses Share and Be Aware Ambassadors who have been at dozens of large events around the state distributing safety materials and answering questions about the laws and responsibilities of all road users. These personal dialogues can go a long way to informing people about the laws and encouraging them to obey them. The Ambassadors are also available to come to workplaces anywhere in the state to give customized presentations on bicyclist, motorist and pedestrian safety. If you would like to have an ambassador come to your workplace, email Jessica, at the Bike Fed. Educating people about the laws and encouraging them to share the road are essential if we are to reduce the number of crashes involving vulnerable road users like bicyclists and pedestrians. While we work to decrease the number of crashes, it is important to keep in mind that riding a bicycle in Wisconsin remains an extremely safe activity. In Wisconsin, 48.7% of residents say they ride bicycles. So even though 2.2 million people ride bicycles in Wisconsin, most years only between 7 to 11 bicycle crashes result in fatalities. As you can see by the chart above, this year we have only had two crashes that resulted in fatalities. 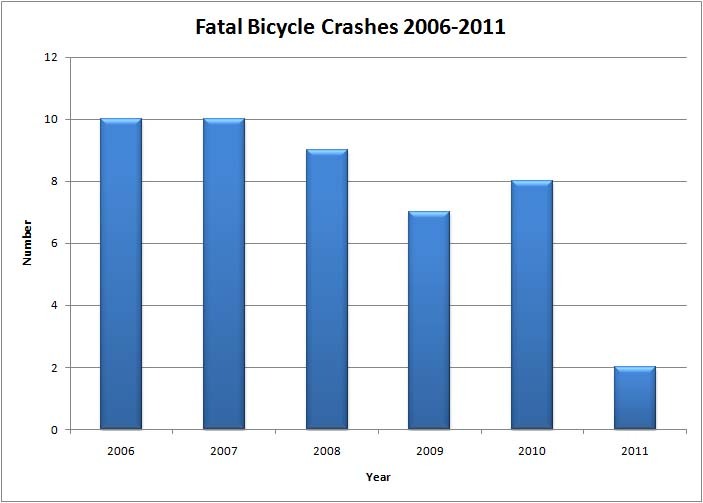 If we look back over a longer period (see the chart below) the numbers of bicycle crashes is clearly trending downward. Even though the number of fatal crashes is so small that it is hard to see a trend, we need to look at those fatal crash numbers compared to the number of people riding bicycles. The number of people who ride bicycles in Wisconsin is huge and has been increasing. Bicycling as a form of recreation is up 47% since 1994, and similar increases have been seen in bicycle use for transportation. Since the crash numbers have remained about the same or gone down slightly at the same time that the number of people riding has increased, then the crash rate has actually decreased significantly in Wisconsin. It appears that Wisconsin’s long history of investments in bicycle facilities like off-road trails, bike lanes and paved shoulders has proven that if you build it they will come. The increases in people riding bicycles also lends credence to the saying there is safety in numbers. Over the next days and weeks as we learn more details about this tragic crash we should keep the family members and friends of Mr. Ferrito in our prayers, and let’s also keep our fingers crossed that if we all obey the laws and share the road, 2011 can go down as the safest year for cycling in Wisconsin history. The area where the crash appears to have happened is another example of incomplete streets. But is is also a great example of how our bicycling infrastructure development often fails to go from “A to B.” Federal and state policies for funding bicycling infrastructure often seems to reward haphazard placement of facilities. When we build facilities they really need to focused on going somewhere, all they way to a logical conclusion, not just some random section of road or trail. If we don’t then dangerous sections will appear in the middle of good infrastructure, reducing the benefits and increasing the risks for all users. That is VERY true Tim. My favorite local example of that is the newly constructed extension of the Hank Aaron State Trail. While the extension is awesome and has increased the number of people using the trail, it does not connect to a number of minor and arterial streets that it crosses. There are at least a handful of local streets that dead end at the trail, but don’t have a formal connection. And the trail crosses several major arterials above grade without ramps down. These missing connections were a result of a limited budget, not poor planning, but even that points to the disparity between how facilities for motor vehicles are built and those for bikes and peds are constructed. That said, we are slowly building a more complete network and must take full advantage of every small opportunity to fill in the gaps, even when those segments don’t yet connect to the bikeway grid. When I heard that this crash was near County Line Road, I thought that it would be in that “no man’s land” where there would be squabbles about jurisdiction. This crash is not too far from where Patricia Blundon was hit and killed. My prayers go out to both the Ferrito and Blundon families. I hope for a quicker solution in the Ferrito case and a solution in the Blundon case. Both these families deserve closure. I ride westbound on County Line Road and turn right onto Nicholson (for that half block) and turn left to the westbound trail (basically the opposite direction of the accident route) 2 to 3 times a week (during the week only – not weekends) somewhere between 5:30 and 7:00 p.m. (basically rush hour). I have to state that I very rarely have a car pass me in either direction on either County Line Road or Nicholson so I find this very disturbing. I am always very cautious turning onto Nicholson as there isn’t much of a shoulder as stated. Also a big concern is at the end of the westbound trail from Nicholson where it meets Hwy. 38 or Howell avenue (2 lane – 45 m.p.h. ish). It rolls down a short steep hill to a T or (90 degree turn) onto northbound Hwy 38 and there is a lot of gravel that is built up that is dangerous in combination with the descent. The very good thing is that there is ample shoulder room on Hwy 38 as this section of the road was recently repaved. It would be nice if that 90 degree turn was more of a northbound “on ramp” if you will. May God Bless Sam and his family – I will say a prayer for them each time I ride this route. Thanks for your comments. I emailed someone I know in Oak Creek to ask for a bike/pedestrian contact person. When I hear back I will forward that to you. Off the top of my head though, I would suggest calling or emailing you alderman to express your concerns (if you live in Oak Creek). I will get back to you with more info when I get it. I do live in Oak Creek and just sent a note to our Alderman – Steven Scaffidi. He is a very good man and I believe he will do what he can to help make this trail a bit safer in the future. Excellent Bill! FYI the Bike Fed has been advised that Nicholson is scheduled for reconstruction. I noticed that it was on the agenda for last night’s Oak Creek council meeting, but the minutes are not online yet. I am trying to get information to find out if the proposed project will include bicycle accommodations. I will try to let you know after I hear back from the acting City Engineer. Let me know via comment here if you have any more up to date information from your alderman. Thanks again for working to make all the roads in Wisconsin more bicycle friendly. One section of road that is waiting for a fatality to happen is Port Washington Road connecting Bayside with Mequon. I personally know three people who have had serious (but thankfully not fatal) accidents, two by hitting the gravel on the west of the road; one by a car that exited the interstate (perhaps the addition of a traffic light will prevent future recurrences). One is still too traumatized to bike. My father was this biker that was killed on Sunday. This was not a slight accident, this was a huge mistake by the driver. Let me explain: My dad was a very safe man who has been biking for years. He was riding southbound in the northbound lane (heading against traffic so he could see the cars coming towards him). The driver who hit him was driving Southbound in the Southbound lane. The driver crossed the center line, crossed into oncoming traffic, drove onto the shoulder of the northbound lane, and hit my dad from behind. My dad didn’t know what was coming because he didn’t expect a car to cross over onto the opposite side of the road. The tire marks on the road also indicate that the driver did not brake until 50 feet after impact. This was NOT a sideswipe where both biker and car where heading in the same direction, on the same side of the road and there wasn’t enough room between them. Police are still investigating why the driver got distracted and crossed over his lane. This is such a tragedy and I hope everyone realizes that this was not my dad’s fault. While we do need to expand the shoulder of the road to leave room for bikers, this did not play into the cause of the accident. I pray that we find out why the driver did what he did, but it still will not bring my father back. The drivers HUGE mistake has turned my life upside down. Something needs to be done to protect bikers–I also pray that we do find a conclusion to the Blundon bike accident, as that was my friend’s mom. Jenna, I am so sorry for your loss. I really want to thank you for letting us know what happened. I have a copy of the crash report waiting for me to pick up Monday at the Oak Creek Police Department. I will probably do a short write up here after I get that crash report. If you would like to talk to me further about the crash after I get that report, email me a phone number so I can call you. I want to be very sensitive to your family as I report about this tragedy further, but I do want to let people know more about it in the hopes that through better awareness we can avoid similar tragedies in the future. Again, thank you for your comment and my prayers are with you, your family and your father’s friends. I am so sorry for your loss. Thanks for shedding some light on the accident. It sounds like your dad made the very common, experienced and logical move of riding on the safer side of that shoulderless road for the turn down County Line Road and every so unfortunately paid the wrong price. May God Bless and guide you and your family during this very difficult time. As mentioned earlier, I ride this route in the opposite direction 3-4 times a week and say a prayer for him and your family each time. I see the memorial of flowers and am so sorry for all of you. My prayers and condolences go out to you, Jenna, also to your friend and her family. I hope law enforcement in both Milwaukee and Racine Counties will put forth their most concerted efforts to capture those drivers responsible for these crashes. Homicide, even with a vehicle as the weapon needs to be taken seriously. I received a note from my Oak Creek alderman Steven Scaffidi this morning that he agrees with my safety concerns and that he is “passing them on.” As I live in a different district I presume he will forward the concerns to the Alderman for that area of Oak Creek. As a frequent rider in this area, Steve will send my offer to assist with practical on knowledge if needed. Bill, if everyone who rode a bike did what you did once a year, the world would be a much safer place for those on two wheels. Thanks for making the effort. I have been in contact with your Oak Creek Police Dept. about the fatal crash. The State Patrol is still investigating, but when I have all the details of a final crash report, I will let people know what happened. You may have noticed Mr. Ferrito’s daughter has also contacted me. I will be reporting the family’s perspective as well. In the mean time, let’s all try to be just a bit more careful out there when we are behind the wheel and on two wheels. Thanks again. I would like to offer my condolences to Jenna Ferrito and her family. I have ridden through or on those same roads for the past 30 years. I wouldn’t be surprised if I crossed paths with your dad at some point. I agree that education and encouraging road sharing is essential, but my daily experiences while riding make me skeptical that will change much as it relates to riding on rural roads. In my opinion, the biggest danger to cyclists on those rural roads is a checked out or antagonistic driver. Many people are living their lives behind the wheel now, and it seems those drivers choose to put attentive driving aside, and conduct their lives while they commute to and from their destinations. I train and ride in Racine county almost daily. During the week, I am usually mixing it up with drive time traffic south of County Line Rd. in the late afternoon/early evening. The once sleepy 4,5 and 7 Mile Roads are pretty hairy routes now. Beyond numerous scary encounters with drivers on cell phones, I recently had to pull onto the gravel shoulder of west bound 4 Mile Rd. while an east bound driver passed another east bound driver at a high rate of speed. How could he not see me if he was paying attention? Did he see me and not care? This is basic drivers education. How would additional education help in this case? Then there is the guy that brushed me while we were both north bound on 5th Avenue in South Milwaukee. I chased him down and caught him at the next stop sign. He wanted to “teach me a lesson” because I wasn’t riding in the the gutter. I’m not sure any amount of education will change that attitude, either. Hey Glenn, thanks for chiming in with your thoughts and experiences. I am the first person to say facilities first. We need more and better on and off road bicycle accommodations that are attractive to a wider range of people riding bicycles. That means more bike lanes and wide paved shoulders for fast road riders and people that need to get places trails can’t take them. The next level of facility though is the protected bike lane like they just finished on Kinzie in Chicago, which resulted in a 60% increase in bicycles to the point that bikes make up 48% of rush hour traffic. Finally, we need a more complete network of off-road trails connecting to quiet traffic calmed side streets (bicycle boulevards). But as I mentioned, every traffic safety issue requires that we use all Es. Enforcement is one of those and at some point we are going to have to begin expecting all road users to obey the laws, especially those whose actions result in the deaths of innocents like Mr. Ferrito. Maybe the only classroom the driver who attacked Glenn Butzlaff will learn in is in a correctional facility. That driver wouldn’t be able to drive a car behind bars. Yes, unfortunately that is true, but at least the section of Nicholson Avenue planned for reconstruction will have a bicycle “accommodation” in the form of a wide curb lane, but no actual marked bike lane. It will also have a sidewalk area. Those are the minimums needed to meet the Trans 75 Complete Streets law.